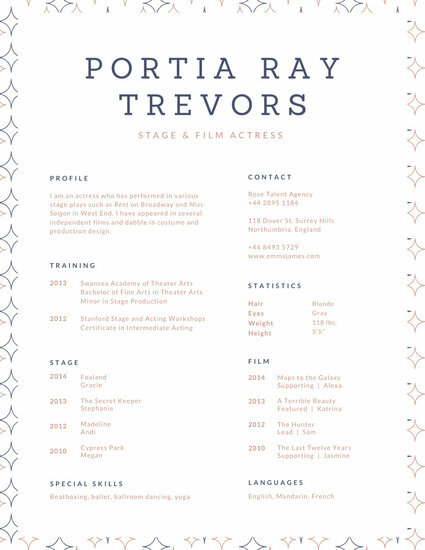 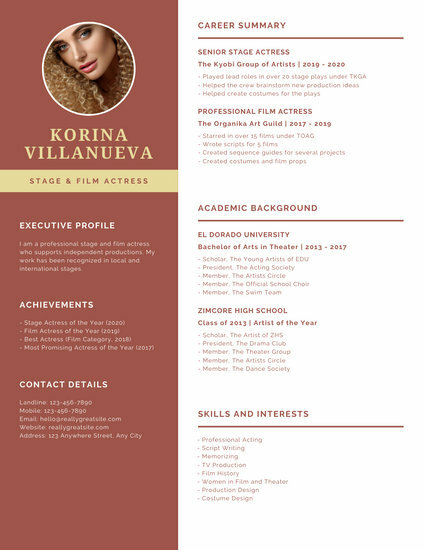 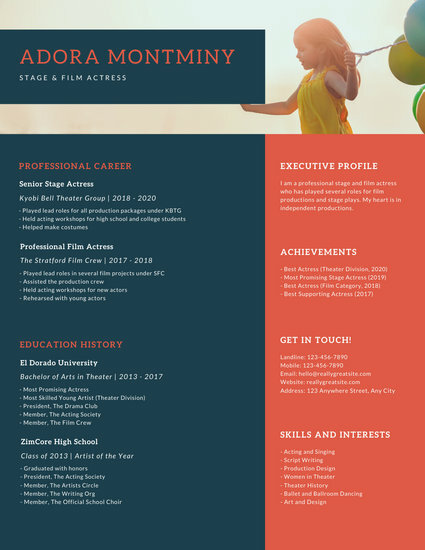 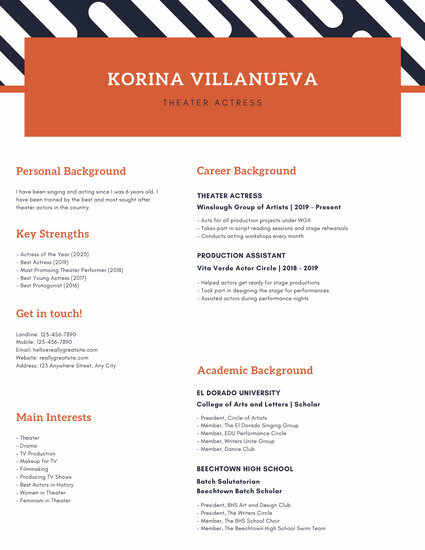 Take one step closer to landing a leading role with a professional acting resume made with Canva's suite of brilliant, ready-made template designs. 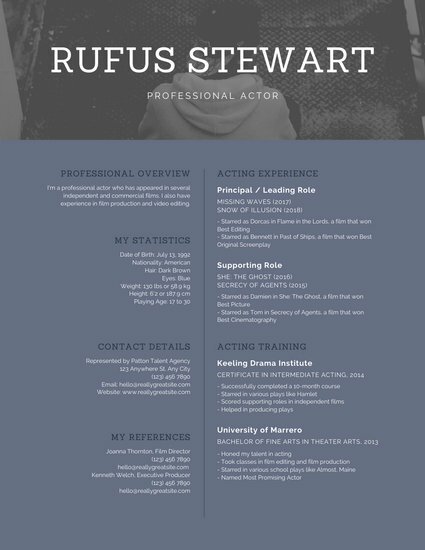 Acting is an art unlike any other. 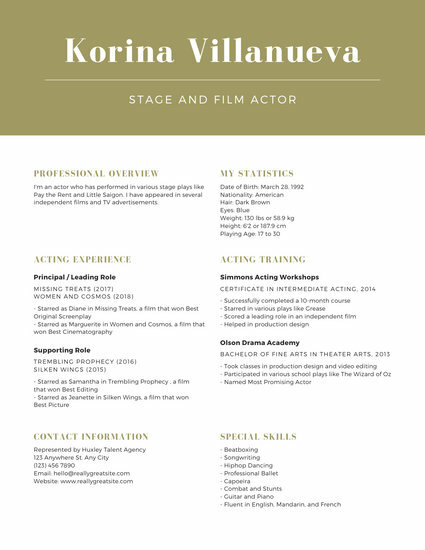 Requiring more than just the ability to memorize lines, it is an occupation that demands long hours, great effort, and a skill for storytelling. 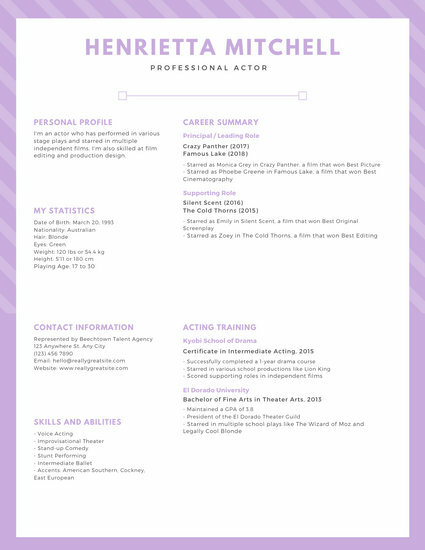 To pursue a career in acting, one must be prepared to audition tirelessly, attend countless rehearsals, travel, and work late hours. Before the colorful experience comes the basics. 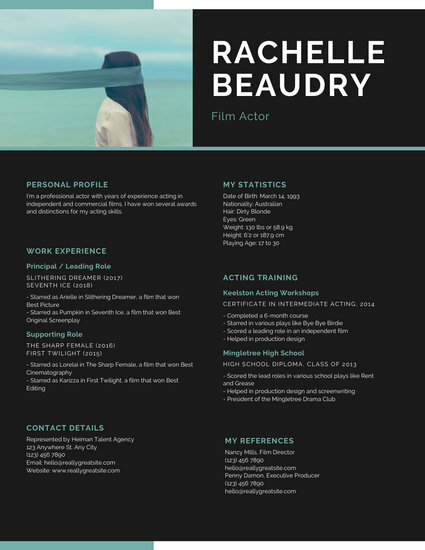 Every aspiring actor must first learn how to make a proper introduction and make a good first impression. 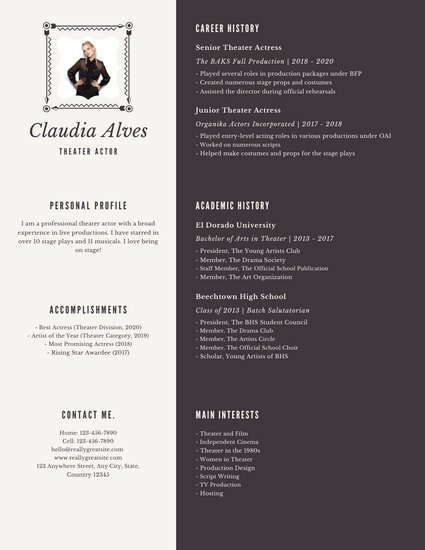 This means having the essentials ready: a stunning headshot and an impressive resume. 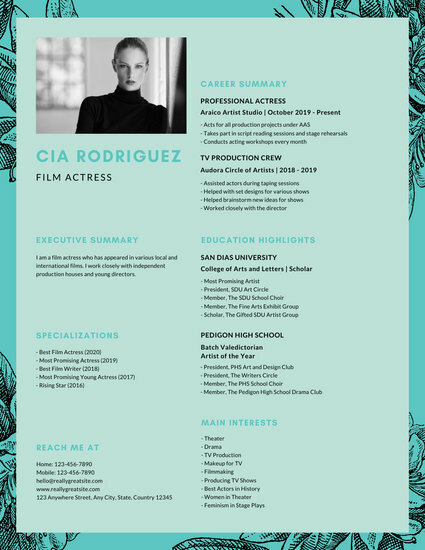 Start building a powerful resume - effortlessly design one that’s uniquely yours using Canva’s assortment of customizable templates and graphic design tools. 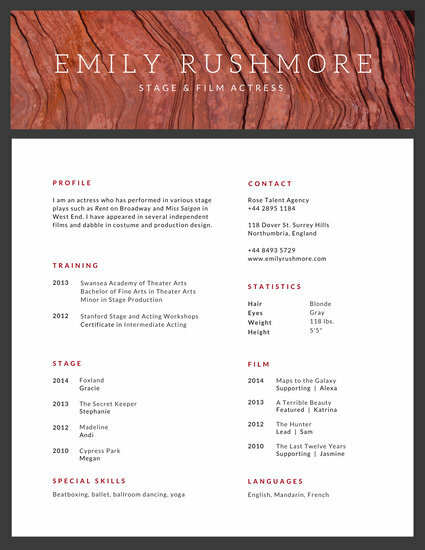 Choose from light and minimal designs to more vibrant ones and turn it into your own work of art. 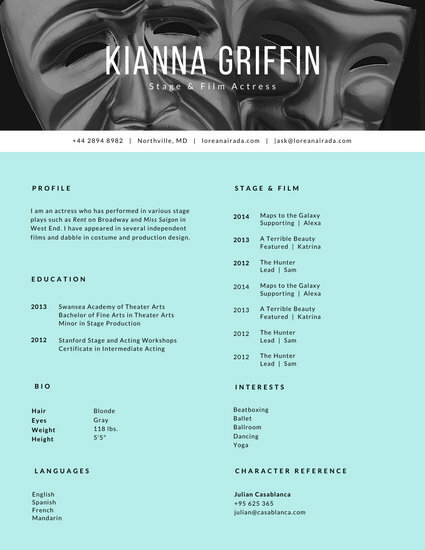 Start with a clean background - browse lightly patterned ones on the interface or stick with a plain color using the color palette generator. 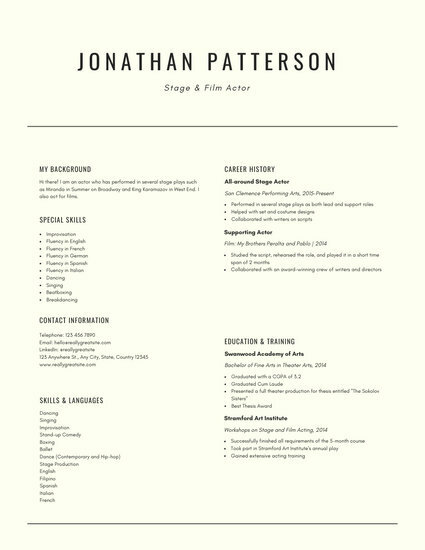 To make the contents easy to read, stick with classic font faces that will give your resume a professional and polished look. 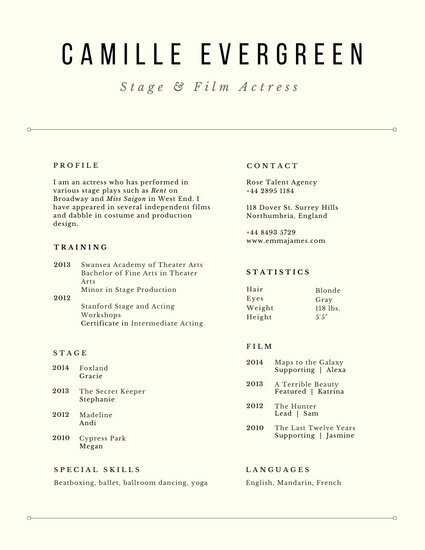 Then, create partitions between sections using lines or by simply allowing ample spacing. 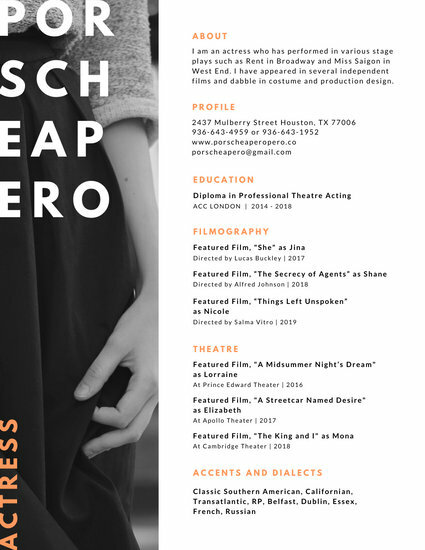 You can also personalize your design further by adding small icons and illustrations on your header and footer, or even beside headings and subheadings. 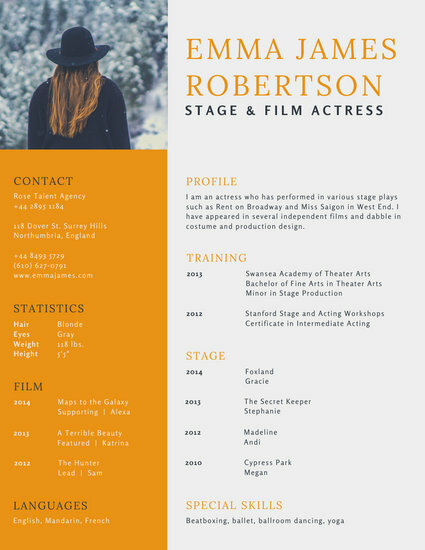 Add a creative touch to a professional acting resume with Canva’s design elements and user-friendly tools. 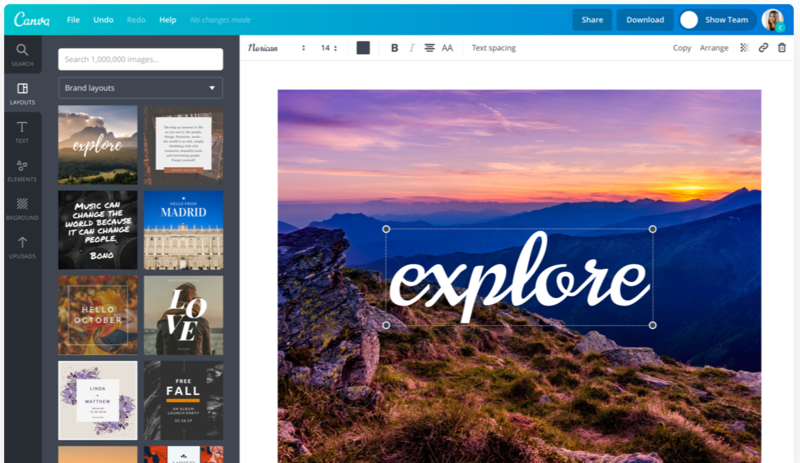 Download your work to your computer or share it through email directly from Canva and you’re all set. 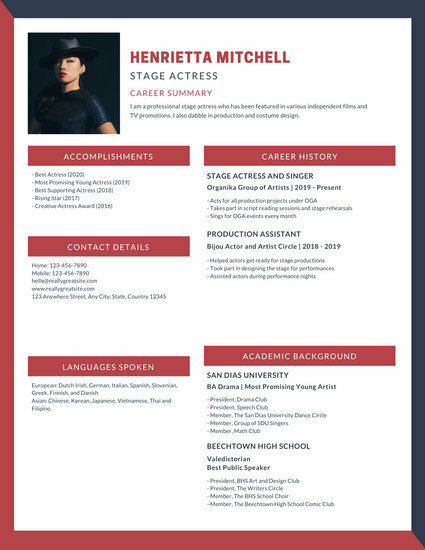 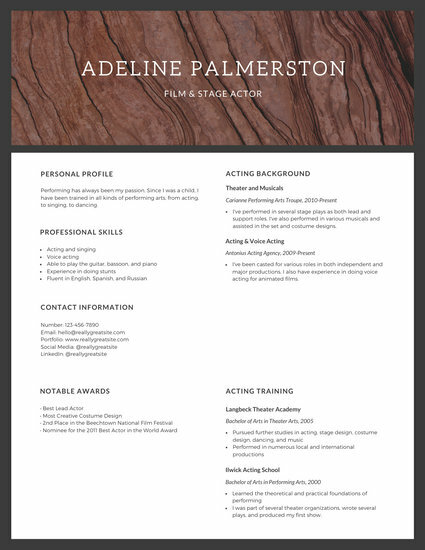 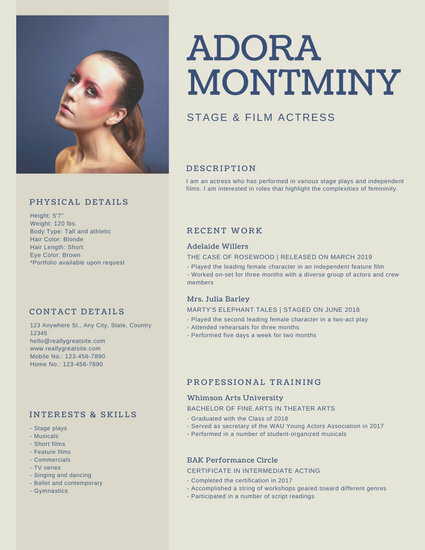 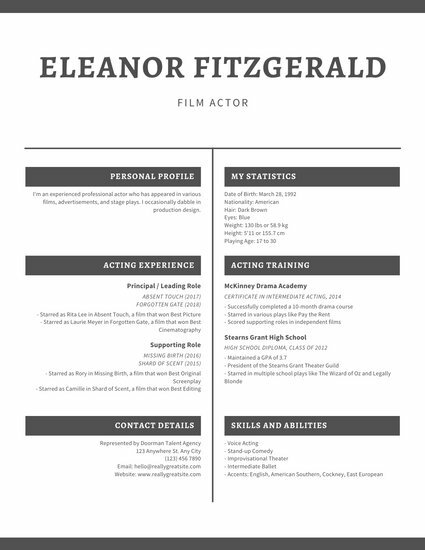 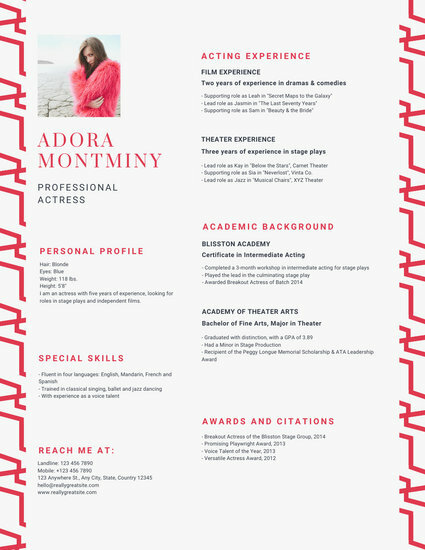 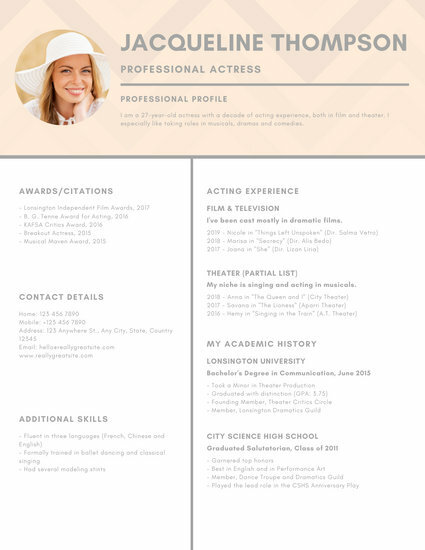 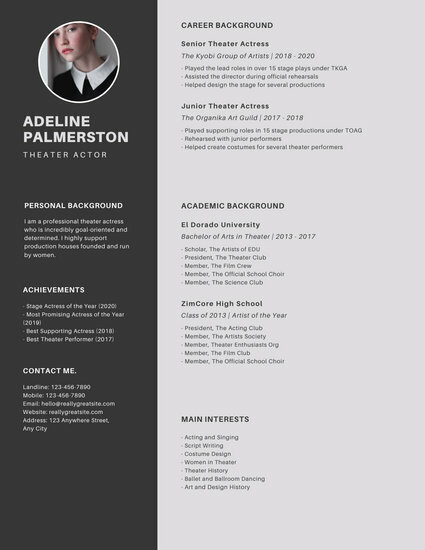 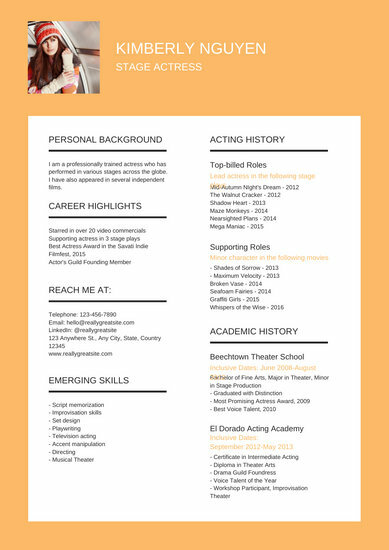 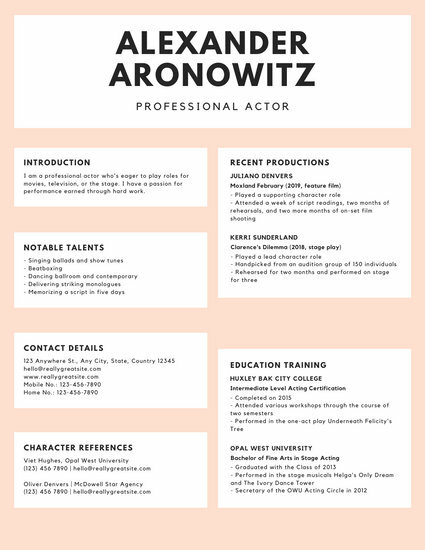 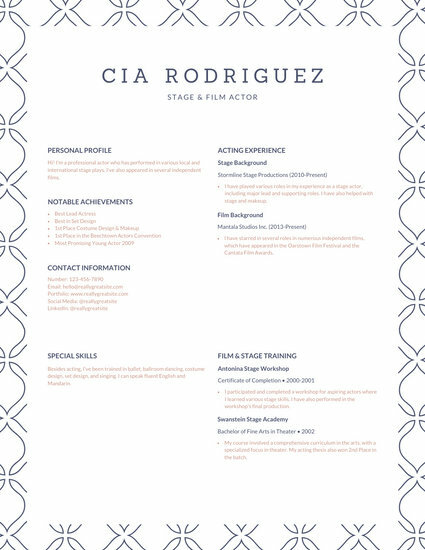 With design features at your disposal, you can create a professional acting resume with ease.